In 2008, Ghana hosted the 26th edition of the continent’s flagship football competition, with an emphatic and elaborate “host and win” agenda. It tragically ended at the hands of a Samuel Eto’o inspired Cameroon in the capital Accra at the semi final stage – a duel that was Ghana’s fifth game at the tournament. One nil it ended, reducing Ghana’s aspirations to a much lower and definitely less fancied laurel on the podium – the bronze medal. Ghana won that bronze medal game, beating the Ivory Coast. Two years later, a young Black Stars team coached by Serbian Milovan “Milo” Rajevac arrived in Angola with wild dreams of going one better, or perhaps, two. The dreams were ‘wild’ primarily because that squad was also very porous and gapingly deficient. It was without John Pantsil, Stephen Appiah, Sulley Muntari, Laryea Kingson and Michael Essien – who had all been part of the country’s version of a golden generation (the team that finally qualified Ghana for a World Cup). Expectations were really low, and measured, as the quality gulf between Ghana and favorites such as Cameroon and Egypt alone could be enough to force them to abandon participating in the tournament itself. The average pundit’s prediction was a quarter final finish, at most. “Yes I may be mad, but I hold the firm belief that the Black Stars will do something special in Angola,” wrote respected Ghanaian football journalist Christopher Opoku in a column before the tournament. This expression of optimism was incongruous in an atmosphere low expectations. But he was right in the end. The Black Stars did something special. Albeit being aided by extraordinary circumstances at the Group stage (Togo had to withdraw due to the infamous Cabinda armed robbery attacks), Ghana made it all the way to the final. In what was, again, Ghana’s fifth game at thee tournament – due to playing only two group games – they were unlucky to have been beaten by a lone goal from opponents Egypt’s super sub Mohamed “Gedo” Nagy. The loss had meant Ghana’s fourth second place finish in an afcon, handing the trophy to the Egyptians who celebrated their record 7th continental triumph. The squad touched down at the Kotoka International Airport in Accra as heroes, who had almost achieved something great against the odds. The silver medal also meant Ghana had gone one better, and following the progression, surely, afcon 2012 was finally going to be the tournament. It would coincide with a 30 year anniversary since Ghana last won the tournament in Libya. Even more interestingly, Coach Goran “Plavi” Stevanovic (who had replaced Milo) qualified Ghana for the tournament with a 100% record, winning all four games, scoring 10 goals and conceding only once. The backdrop had all the ingredients of a fine story. It was almost as if winning the trophy was something that was naturally going to fall in place. The squad that represented Ghana in Gabon and Equatorial Guinea was not missing any influential player. Plavi had promised to deliver the trophy to Ghanaians. It was not as if he had a choice, his job basically depended on it. “We are a confident, compact team. We want to win. Nothing else is acceptable for me.” He told the press before the tournament. Gary Al-Smith, an African football specialist, asked him if he should be sacked should Ghana fail to win the trophy. His response was simple: “Yes, sack me”. Three words. Three simple words. Motivation? Check. Storyline? Check. Squad quality and depth? Check. Nothing was going to derail agenda “Ghana for gold”. It was time. After making it out of a group containing Botswana, Guinea and Mali with two wins and a draw, the Stars dramatically beat Tunisia 2-1 in the quarter final. A semi final berth with Zambia (Ghana’s fifth game at the tournament) loomed. Zambia, despite being impressive hitherto, were always going to be overwhelming underdogs. But one thing Ghana failed to consider was that the Zambians were perhaps better motivated. They equally had every reason to believe they could go all the way. On the 27th of April 1993, a plane carrying the Zambian team en route to Dakar, where they had been scheduled play Senegal in a World Cup qualifier, was involved in a fatal accident 500 meters off the shore of Gabon that claimed the lives of all 30 passengers and crew, including 18 players and their coach. Their presence in Gabon, and run of form in the tournament was for a reason, or at least, it proved to be. Their manager, Herve Renard, had been part of Coach Claude Leroy’s backroom staff for Ghana in 2008. Renard knew Ghana, and he sort to make sure Zambia’s poetic journey in the tournament inspired by the memories of their predecessors, was not going to be cut short – especially not by the team he knew so well. 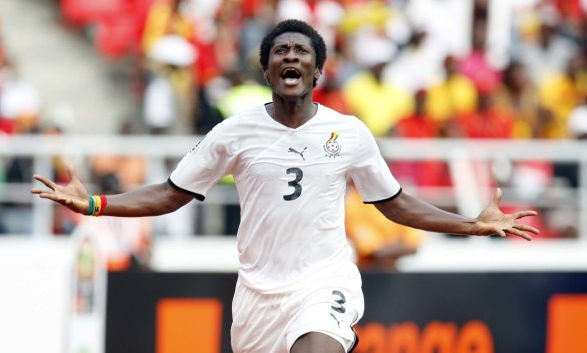 Asamoah Gyan missed a crucial penalty that could have won Ghana – who had outplayed Zambia – the game. Zambia, amidst being basically strangled, managed the definitive knock out hook that sent Ghana’s aspirations crashing. The disappointment hit hard. It opened a Pandora’s box of startling revelations. The blame game began in earnest. In a post tournament report by coach Goran Stevanovic which leaked, there were mentions of players resorting to the use of juju (Black Magic) to stifle each other’s progress in camp. There were reports by journalists who traveled with the team suggesting that there were serious cleavages in the squad. Disunity, factionalism, player dissatisfaction – the accusations and conspiracy theories erupted, in a desperate bid to diagnose the cause of failure. Coach Stevanovic did not survive the ensuing heat. Those three words came back to haunt him. “I like it when people under-rate me. It is always good to be the underdog,” a typically modest Appiah told BBC Sport. In the build up to afcon 2013, Appiah’s Ghana were unbeaten in 6 matches, and looked conditioned to launch a genuine bid for that elusive gong. The team was not entirely cooked; it was very much under construction, and the people understood – or they thought they did. Whilst acknowledging the squad was in transition, they at the same time thought winning the tournament was supposed to happen. More like a divine right. It had been a half century since Ghana’s first ever afcon triumph. An opening day draw against the DRC was followed by a narrow win against Mali, as well as a comfortable win against Niger to book a place in the knockout round. Cape Verde proved tough opponents in the quarter final, but an “unimpressive” – according to most fans – Ghana ground out a 2-0 win, proving once again they could get results even on bad days. Burkina Faso, the tournament’s surprise package, stood in between Ghana and a second final in three years. It was to be Ghana’s fourth straight semi final appearance since 2008 and the second time the country had made four consecutive semi final appearances (first time was from 1963 to 1970). Amongst other statistics, it was also Ghana’s fifth game at the tournament. The fifth. The Black Stars struggled – forcing a one-all regulation time draw. Extra time failed to produce a winner. Penalties beckoned, and Ghana knew – per their history in shootouts – that another disappointing end stared them in the face. By the time Emmanuel Agyemang Badu stepped up for a chance to keep Ghana in the tie from 12 yards, that mythical fifth game curse was about to complete another cycle. Agyemang Badu missed his penalty, meaning Ghana had crashed out in the fifth match for the fourth consecutive afcon tournament. The fifth game. Always the fifth game. Always. In two years time, if Ghana indeed are able to qualify for the next afcon in Morocco, the fifth game – if they manage to get there at all – will hopefully be tackled with extra effort and a 110% commitment. Anything to fight that enigmatic curse. That fifth hurdle curse that has stultified the dream for Ghana’s fifth continental gong. I don’t think it had anything to do with a mystical number five. First Ghana had been lucky enough to even GET TO semi final on those occasions. Save in Ghana 2008, and 2010 the black stars have not wowed in any quarter final. To put it quite blatantly, Ghana isn’t particularly good enough, we haven’t done much. If you.look at the team, complacency seems to take the better part and instead they start thinking of a final berth when they haven’t even played against the semi final team. It is no coincidence that when we meet under dogs we fail. And having Akwesi Appiah at the helm of affairs still doesn’t change anything. He is tactically inept and he read.exposed by the DRC and Cape Verde. By all accounts they.had to win the game.